AIR SHOW RADOM 2018! The 16th edition of International Air Show will take place on 25th and 26th August in Radom (Radom - Sadków Airport). The event marks the 100 years jubilee of Polish Air Force and 100 years of Polish Independence. AIR SHOW 2018 - TICKETS AVAILABLE NOW! Do you want to be informed of the sales start, special contests, new tickets, special pass codes and many more? Join our FAN ALERT - leave your email adress and get all the benefits! The attendance list is far from being closed - stay tuned for more announcements! Apart from international teams and soloists, the Polish squad will make quite an entrance! 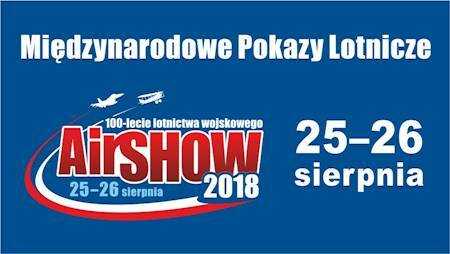 We will see: Biało-Czerwone Iskry (White-Red Sparks), Orlik, Żelazny (Iron), Flying Team - Warsaw Aeroclub on AT-3 aircrafts, Fulcrum Drivers Demo Team from Malbork, Fulcrum Solo Display Team from Mińsk Mazowiecki, F-16 Demo Tiger Team and more!